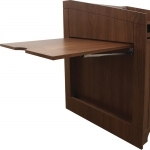 The hidden flush drop leaf is almost invisible when closed because the grain is a perfect match with the cabinet side. When open the top is flush with the work surface. We offer a superior, stainless, drop leaf mechanism. The release is very positive and it locks in the down position. Weight limit is 60 lbs. 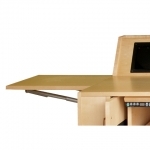 Our designers have come up with an electric height adjust mechanism for our heavy duty drop leaf. Eight inches of travel. Perfectly smooth and whisper quiet. Weight limit is 60 lbs. 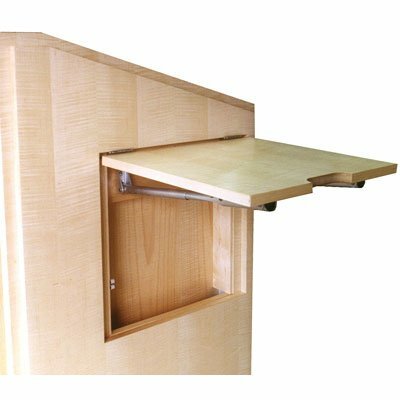 Our heavy duty telescoping mechanism is built into the side of the cabinet. When closed it’s almost invisible because the grain is a perfect match with the cabinet side.